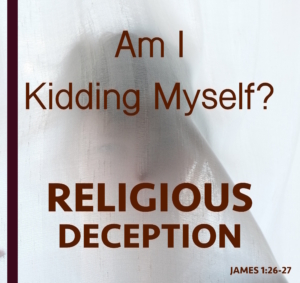 Do I think I am religious, but living in deception? We LOOKED at being a hearer vs. a doer of the Word. We want to understand pure religion in the light of being a doer of the Word. O Lord, we thank you for the Truth You have for us. By Your Spirit teach us and grant us the understanding we need. Give us ears not only to hear, but may we receive Your Word and be doers. Thank you! Let GODcha lead and guide you. Where will you jump in? Remember you are learning the most critical skill to see God’s Word accurately! Let’s focus on James 1:26-27. Verses 19-25 are about being a doing of the Word, not a mere hearer! Now, what is being contrasted? How is the true response to the Word of God seen in our lives? Do you see: the 3 things that prove one to be a doer of the Word? Wouldn’t those 3 things be Key to these verses? Let’s unfold v26 by checking out religious, religion and bridle the tongue. Let’s see ‘how’ our response to the Word is seen. Religious, threâskos; devout; only in James 1:26, the diligent performer of divinely ascribed duties of outward service to God. Is predominantly the ceremonial service of religion. It is the external framework. According to James, true thrēskeía or religion is not merely ceremonial formality, but acts of mercy, love, and holiness. Religion, thrēskeía; ceremonious in worship (as demonstrative), i.e. pious:—religious. Adjective meaning fearing God, pious, religious. Bridle, chalinagōgéō, to lead, direct, govern. To direct or restrain by a bridle. Figuratively, to restrain, govern or control (James 1:26, of the tongue; 3:2, of the body). 1. According to Matthew, what does it mean to be religious? Am I outwardly beautiful, but inwardly unclean? Do I appear righteous to men, but inwardly I am full of hypocrisy and lawlessness? 2. Why did James pick the tongue out? What did Jesus say about our mouth in Matthew? We see: Whatever you and I are on the inside, comes forth from our mouths. We see: What we say is tied to our inner most being. There will be a punishment. Our words either justify or condemn us. We will be held accountable for every idle word. Are my words positive or negative? Do my words build up or tear down? Are my words loving, gentle, kind? Or, are my words evil, destructive, arrogant, foolish, multiplied, hateful, filthy, etc.? Do I assume responsibility for my words? What do my words expose about my heart? In v26, James introduces another contrast. What does James say one is ‘doing’ vs. ‘NOT doing’? Do you see: one is claiming to be religious but can’t bridle their tongue? What is true if one CAN NOT bridle their tongue? The man deceives his own heart and his religion is worthless. Note: the Grammar for both ‘not bridle‘ and ‘deceived‘ is present tense. Meaning: The individual who habitually continues to NOT control their tongue, is one who continually deceives his heart. Their religion is worthless [empty]. We see: To be a ‘doer of the Word’, is to OBEY, keeping a tight reign on our tongues. Understand: If the tongue is NOT controlled, the heart is not transformed. THINK: How can we control our tongues? Check out Zec 4:6 and Act 1:8 which are not in GODcha. God empowers us to control our tongues. Do I claim to be or think I am religious, but can’t bridle my tongue? Do I realize I am deceived? Do I understand my religion is worthless? Or, am I able to control my tongue? Even if I slip up, do I desire to honor God with my tongue? We’ll Connect the Dots Tomorrow! The Proper Response to the Word, is LIVED out without deception. Take a minute to put the Definitions and Cross References not only in your Notes but also in your hardbound Bibles next to Jam 1:26-27. You will be so glad you did! FATHER GOD WHO ART IN HEAVEN, we continue to praise You and thank you for Your Word. Father, I so pray that all of us are beginning to understand – how we respond to Your Word is another test of our faith. And as Paul told us to examine ourselves (2Co 13:15), I pray we would do that today. Father, I pray Your word has exposed us, and we would be willing to admit if we are like the Pharisees, outwardly beautiful, but inwardly full of hypocrisy! What is truly in our most inner being? May we stop and take a look at our hearts, at the desires of our hearts, and how that spills out in our speech. Change our hearts oh God! May our words not condemn us Lord! Oh Father, may not a one of us leave Your presence today, deceived! May our religion not be empty, worthless! I ask that we would know and understand that true religion is seen, that it is evident in our lives! Help us to receive and do Your Word as You have commanded. May we confess and repent of those times we have not controlled our tongues. And this day, may we commit to bridle our tongues (whether spoken or written), honoring and glorifying You in our speech. We ask this in Jesus precious name. Amen! Next: we will unfold the other 2 things that prove we are doers of the Word.